The following is a chapter in “A Comprehensive Theory of EarthBound,” a series that aims to better understand the storytelling of Shigesato Itoi’s landmark video game. Find the full series here. Happy villains are all alike; every unhappy villain is unhappy in their own way. By far the most infamous moment of EarthBound—the one that seems present every time a “10 Video Game Moments that Wrecked Your Childhood” gets compiled—is its final encounter. It is true that Giygas, who will receive his due in a later chapter of our theory, is uniquely terrifying, a lumbering and truly ugly thematic collision between the imagery of birth and the terrifying formlessness of death; but we only gain a sense of him at the end of EarthBound’s plot, and EarthBound is tinged with dread throughout. If Giygas isn’t conferring this sense of everpresent dread via his direct presence, then who or what is? We spoke also in the first article of this series about EarthBound not being a game that is easily definable by role-playing gaming’s traditional good-vs.-evil dynamic. Giygas’ absence for much of the game not only accentuates the dramatic effect of its very late reveal, but also establishes EarthBound’s theme of the ‘insignificant hero’ in an uncaring world: it shores up the game’s tone of moral ambiguity, contra the wholesome moral dichotomy that is tonally familiar to most heroic narratives. In the game, as in this article, EarthBound’s great evil is generally only hinted at. However, a game that merely exists on ambiguous terms relative to its villain is a game that threatens to simply run rudderless. One of EarthBound’s unprecedented leaps forward in video game storytelling is its narrative utility of banal evil: that which operates regardless of grander evil, in forms and in ways recognizable to the gamer. This banality can be defined as “the combination of the horrifying and the ordinary,” a marriage frequently alluded to in our theory’s prior installment. Many games follow a certain dramatic logic, which, no matter how fantastical in presentation, foregrounds some kind of promise of the eventual prevalence of good: a promise that the hero, though always in danger, will never come to irreparable harm. In the traditional RPG, potions and magic healing spells do something to abstract the threat of evil being able to do serious, commutable injury; paradoxically, the RPG guarantees safety from harm as much as it guarantees and revels in threat. It is easy to maintain the credibility of this delicate paradox, and its power to suspend our disbelief, in the abstracted environments of elves ‘n’ orcs, potion, even swords. That guarantee of safety does not seem to be there when the “evil” one is facing down is just a man in the street with a knife. So here we will analyze another fundament of EarthBound’s thematic map: some of its many banal antagonists that tell the story of the wider evil perpetuated by its long-kept-from-us major antagonist, as well as what Ness’ proximity to his antagonists tells us about him. We will analyze how these figures craft the subtle horror that permeates the length of EarthBound even in the general absence of its final Big-Bad—a horror that routinely blurs the lines between good and evil for our kid “hero,” Ness. An element of EarthBound not as often underscored as its creeping, untellable darkness or its humor is its overriding vitality: the degree to which each of its episodes and areas feels alive, flush with real personality. One way in which EarthBound attains this is through the junctioning of its fantastical elements to its banal ones. 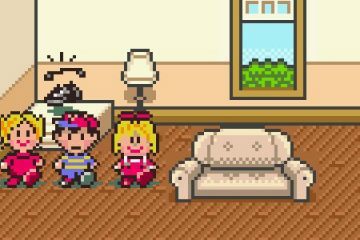 There is much perfectly mundane goodness on show in EarthBound, whether it’s in the form of Ness’ sweet mother or the faithful friendships fostered between Ness and Paula or Jeff and Tony. And where there is banal goodness, sense suggests there must surely also be banal villainy. 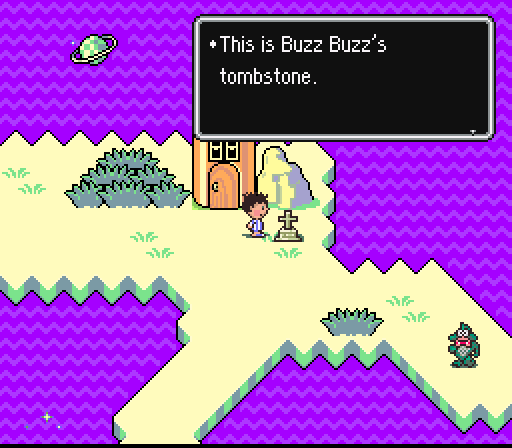 In our last installment of the Comprehensive Theory of EarthBound, we gave a lot of ink and consideration to the child’s horror of the strange place. But what about the child’s horror of the strange person? There aren’t many stranger than the scion of Burglin’ Park, the nattiest man in Eagleand: Everdred. We see banal villainy in EarthBound evinced in a way that directly illustrates the term: characters that are funny and parochial enough to justify their essential mundaneness, but that still act in a way that is heedless or spiteful enough that we might think of them as ‘villains’. Everdred is the quintessential example: an arch-thief and a lover of haikus whose parting legacy to Ness is 17 syllables about locking your door when you go out; a guy who attempts to kill, or at least rob, a child on a whim, who then steals 10,000 in bills and gives it to the kid after the kid gives him a thumping. It is the likes of Everdred’s presence (even more than his loud Hawaiian shirt) that gives color to the game’s general landscape: he represents the way banal evil shifts capriciously, and is as likely to warm to you as it is to harm you. We have remarked upon EarthBound’s overwhelming vitality; it is characters like Everdred, operating heedlessly between the poles of a moral dichotomy, that are responsible for it. The degree to which their actions cannot be predicted, their alliances mapped, nor their ultimate significance measured, is what gives a determined sense of conflict, and thus narrative urgency, to this ‘game without a villain’. We spoke earlier of how EarthBound’s sense of huge scope and limitless possibility confers a creeping unease on the gamer. The unpredictability of its stable of villains—in guise and behavior—contributes to this uneasiness in a similar way, and is facilitated by the smaller, less grandiose bounds that these villains populate. Moving back to Everdred specifically, we might see that he is not a villain because of what he does, in the sense that it is predetermined, so much as because he just ‘does’ it. We sense that many of EarthBound’s opponents act not from any nefarious evil plan but from basic instinct; in Everdred’s case, that instinct is materially acquisitive and, perhaps, the hedonistic pursuit of the thrill of the fight. We sense this caprice just as cleanly when Everdred just puts Ness up by 10k as when he first leaps off his Burglin’ Park hideout to fight him. This sense of out-of-control action peppers EarthBound and results in many of its moments of genuine humor—but with a slight adjustment in focus it can reveal considerable, dire truth in jest, as we are made to behold an ‘evil’ that has a limited understanding of itself and what motivates it, an evil as dangerous for its instability as its intent. As we will see demonstrated much further down the line, this is one of EarthBound’s abiding remarks about the nature of evil. Everdred seems fierce at first, and not merely fierce but wily too, a rogue protected as much by his cunning and instincts as by his hardiness in combat. Everdred impresses us then, and he does it again when we are entreated to situations that show off his generosity; and who wouldn’t love that simultaneously grimy and resplendent sense of fashion that he sports? At times, there seems something winning, comforting even, in this would-be villain, particularly the manner in which he comes over to our side. Though we meet him with a begrudging respect for his might, later on in the game we find Everdred beaten to the point of blurry vision in a city alleyway, surrounded by a gawping crowd who will not go near him to help. Suddenly this character, in dire need, is presented differently to us, and the tenor of EarthBound’s banal villainy demonstrates another utility beyond merely providing us with conflict. In Fourside we see this character, which we once regarded with a certain measure of cowed anxiety, in a state of utter vulnerability and injury. It is not so much the state in which we see our old enemy/ally that might give us pause, so much as the huge leap in characterization. Everdred junctions his allegiance to Ness primarily upon Ness’ display of power: before Ness’ proves he is the stronger fighter, Evered is Ness’ enemy. After Ness defeats him, he suddenly becomes something of an ally. So far, so Pokémon. In plenty of video gaming universes, all villains—from mooks to bosses—seem fairly unified in allegiance to stop you. Threat may be everpresent, but the moral lines are drawn and do not shift. When we see Everdred laid in that alley, made to look a pipsqueak by Monotoli’s men, we see that EarthBound plays the survival-of-the-fittest principle so faithfully that even its bad guys beat up on the lesser bad guys where it is deemed necessary. In EarthBound, threat is ever-present, because power stands only for itself, along no other moral lines. 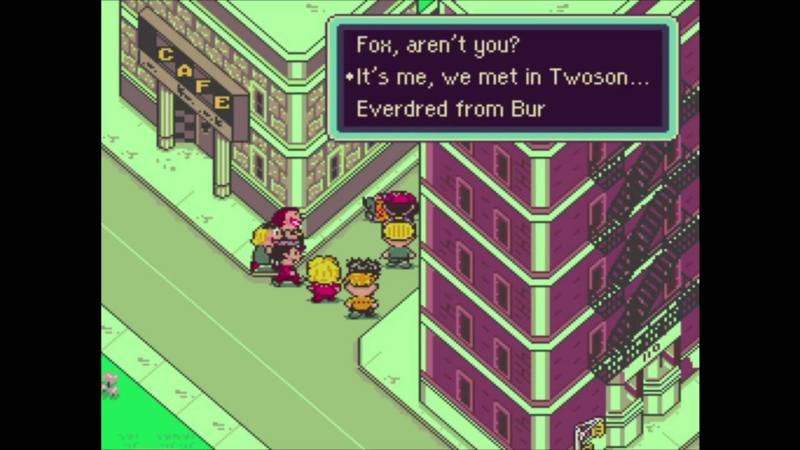 We realize that Everdred became our ally not purely—if at all—because our righteous victory over him awakened some dormant good in his soul, but rather because power wins allegiance: in EarthBound’s dog-eat-dog society, today’s villain can be tomorrow’s ally and (perhaps) vice versa, purely depending on who wields the bat. The only thing that we can truly say is driving the events of this world is some untellable, cosmic will-to-power. Amidst the ceaseless moral back-and-forth that Ness must necessarily entertain to fulfill his objective in this indifferent world with its variously moral and immoral inhabitants, this is a suggestion that Ness has become infected, or at least easily associable with, that banal evil. Ness is, as we are often reminding ourselves, just a child. If one child can be passively associated with the banal evil we are speaking about, then we shouldn’t be surprised if another is made the active target, and ultimately the vessel, of that very same banal evil. It was Tolstoy who said that “Happy families are all alike; every unhappy family is unhappy in its own way.” From that sentence, the first of Anna Karenina, many readers (wrongly) presume that Tolstoy is passively approving of conflict, from a desire for “interest.” In EarthBound, as in Tolstoy’s work, we get a sense of how pronounced evil that begins in the home can grow to be, regardless of how mundane are the set of circumstances in which it is born. This is evidenced by the abusive Minch household, and in how the elder son, Pokey, rises to an unlikely primacy in EarthBound’s moral scheme. Aloysius, Pokey’s father, both lives for money and is untalented with it; before the game begins, he loans Ness’ father “a hundred thousand dollars or more.” Aloysius takes out his rage on Ness’ father’s inability to pay the loan back by administering beatings to his own sons, Pokey and Picky, all the while bemoaning that the Minches now “live in poverty” in their fabulously grand house. Lardna, Pokey’s mother, blessed with one of EarthBound’s most whimsically grotesque character designs, is just as bad. She is a caricature of the wife of new money, bearing such a passive relationship to her sons and husband that, when Aloysius and Pokey leave Onett to work as consultants for Geldegarde Montoli in the big city, she has neither any idea why nor for where they left, nor any compulsion to find out. She, unlike her husband, does not beat her children; but she can be heard telling Ness that she believes Aloysius goes too easy on the boys, the implication being that she would hit them all the harder, had she the animus and drive to do so. It is also Lardna who catalyses the first scripted episode that establishes the fragility and open-endedness of EarthBound’s Libra of justice: despite being a character of no real power, she effortlessly swats and kills Buzz Buzz, who, up until that point, had served as Ness’ protector against xenoid enemies by whom Ness was hopelessly overmatched. 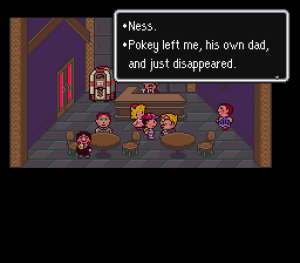 Pokey’s subsequent spite and vengeful nature cannot have stemmed from anywhere but his domestic surroundings, which the game takes particular care to detail. It is the game’s most readable instance of how seemingly everyday failures of character—the father who is brutal, the mother who is neglectful—can inculcate an ‘evil’ that springs beyond the banal. Reading further along these lines, we may understand why Pokey later operates with such ease even in Eagleland’s most adult or bizarre environments, like Happy Happy Village or Fourside: he has already been subject to plenty of the adult dissonances that pox these areas, and so their vicissitudes do not cow him as they would the more tenderly-brought-up Ness. Though it does not excuse the Minches’ conduct, the sad saga of Pokey’s home life also implicates Ness, for it is Ness’ father’s debtorism that provides Aloysius and Lardna with the “rationale” for abuse. Again, as with Everdred, Ness seems closer to the perpetration of immoral or amoral acts than a rote hero might. In the world of banal good and banal evil, to whom do we look for our protection; kids like Ness? It is unlikely, given that kids these days are shorn of PSI powers and are not full of instruction in heroics given to them by extraterrestrial Anthophilas. The ones we look to when we need defending from thieves, common thugs, or—Heaven forbid—our own family are those boys and girls in blue, the police. 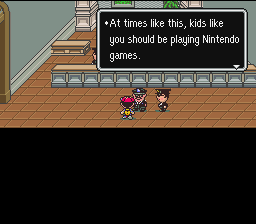 True to EarthBound’s faithful rendering of everyday ‘American’ elements, the police are richly characterized throughout the game. It is the manner in which they are satirized, and their relation to Ness specifically, that make some of the work’s clearest and sharpest remarks on the nature of power, and its junction to moral principles. 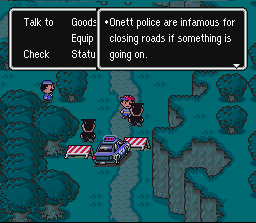 They may seem minor in the context of the entire work, but, in what they say about the relationship of good and evil, the police of Eagleland cut to what we might call the heart of EarthBound: the core of its ethical and philosophical themes. They are, in short, a varied lot; but all of them have power, and power is liable to corrupt. It is crucial to understand that, in the heart of EarthBound, evil is not situated as a cut-and-dry element across and apart from good. From its use of winsome aesthetics to the rich attention it pays to the etiology of its characters’ misdeeds, EarthBound attempts to remove the flat, black-and-white judgment calls many games invite their players to make about heroes and villains. EarthBound’s wide use of banal villainy is apt to make us meditate on the nature and practice of evil, and this is easier when we are generally free of a figure of pure darkness that would take us away from our tendency to reason with its vastness or abominableness. This demonstration of the way the good and the bad can be—perhaps must be—intimate to one another is the heart of the work. Indeed, by the point of its final chapter, EarthBound has invited us to feel some measure of sympathy for the “evil.”We get an inkling of this during Everdred’s scripted appearance in Fourside after he has been assaulted by Monotoli’s henchmen, which is his last appearance in the game and perhaps canonically. Regardless of his ostensible villainy, Everdred departs having given us a sense of what fundamental hardiness, bravery, and perhaps even nobility reside somewhere in his constitution. 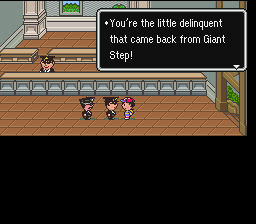 Indeed, beyond what any given law-enforcement character in EarthBound does, the law and order of Eagleland’s most egregious act of banal evil is sloth and disinterest; they do not even realize what is happening in their midst, necessitating that Ness step up to the plate. Their misuse of power is fundamentally an un-use of it, as EarthBound’s metropolitan areas are left as unsafe as its wilderness. The corollary of this is the children of Ness’ age can no longer play safely in the street, and society begins to crumble. While we might tut or scoff or even entertain a measure of shock at the pure spectacle of Onett’s Captain Strong having Ness fight against “five of [the commander’s] best men.” We might even be invited to a measure of sympathy for these men: after all, Ness has already defied them by trespassing as necessary to reach Giant Step and his first Your Sanctuary location. He can only seem a “delinquent” to them based on what they are able to know; what’s more, he is armed (lightly), and will not back down. What can they do except try to apprehend him by force? 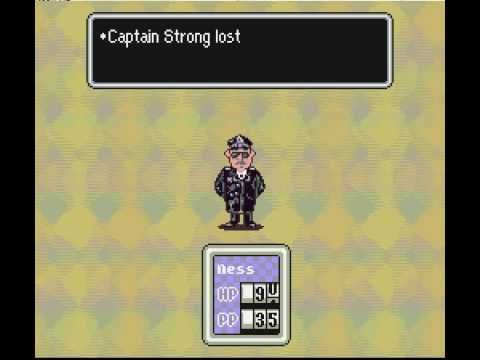 Yet, when Ness eventually defeats of all five of Strong’s men and Strong himself, we get a sense of how far beyond the conventional precepts of his universe he is. In an ordinary gaming universe, the player might be expected to show some measure of fealty to these adult authority figures—to feign compliance before finding some way to circumvent their rules that hold the player back from dealing with her quest. Not in EarthBound: we are expected to go toe-to-toe with these trained professionals. 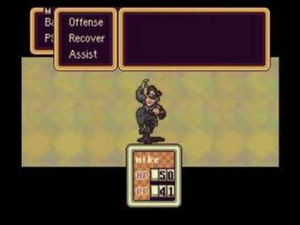 But seeing as we have how seriously EarthBound takes so many of its you-cannot-be-serious moments, we must not take for granted that this is just a joke, or a moment of brattishness on the part of the story’s creators, to thumb a nose at the police and show how they’re not so tough, even when picking on someone half their size. Rather, we can see in his defeat of the policemen of Onett that what separates Ness from these banal villains is neither a divinely conferred righteousness nor the extent of his own power, but rather how responsibly he wields it. Ness fights the policemen only because he has to. He has broken the law and replies to its force with force; all that separates Ness from his would-be assailants is his rationalization of why he does this. For all his power and purpose, Ness still moves through Eagleland as any child might: beholden to his allowance, in frequent need of a donut or a pizza as a pick-me-up, at a loose end to the adult business going on around him. He might have PSI abilities, there might be insalubrious Mr.-T types who will sell him bottle rockets, but he cannot legislate, cannot win adult respect, can neither rally nor organize. Ness’ responsibility is to “fix” this world, and the only way he can do that is by descending to the moral level on which Eagleland’s crisis operates: the survival of the fittest. Taken more as a piece with what else we have studied, we might also be moved by the saga of the police to a measure of sympathy with the rest of our banal villains. Whatever their stated position, they, like the Eagleland police, are fighting something they do not understand: not some pan-dimensional being that perpetuates evil from beyond time, but rather the degree to which they themselves are not conscious of the wrongful deeds they commit, permit, or inspire others to commit. A lack of nerve, or vision, or wisdom, if we might diagnose it as such. These cops might seem repellant, attempting to exact such force on a boy, and perhaps they really are; but there is more to understand than merely that, and no reason to just stop there. A common thief, a dastardly family, some shiftless cops; EarthBound’s enemies are figures we are likely to fall afoul of sometime in our distinctly psychic-power-free, heroic-quest-deprived, everyday lives. EarthBound argues that they carry every bit as much thematic utility and allusive richness as the more totemic figures of evil so familiar to video gaming’s fibers of being. 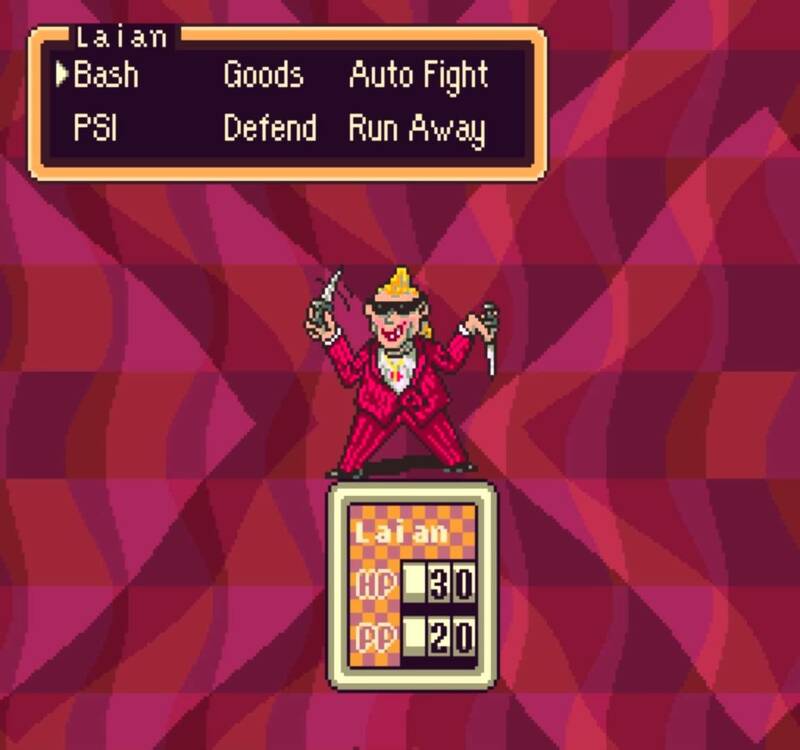 The banal villainy of EarthBound is at once comically endearing, disconcerting in what it suggests about the game’s erratic metaethics, and an important didactic strain in the game’s final “moral” lesson: the implication being that, were many of these people willing to “fight” against themselves as Ness is obliged to fight against them, the final storied confrontation with Giygas might not even be necessary. Evil of a transcendent kind is rare, and it is precisely the fact of this that presses the intimacy of Ness with those with whom he comes into intermittent conflict. 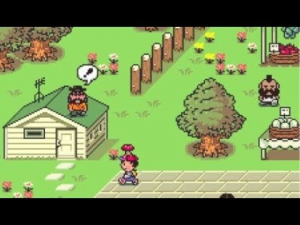 The villainy of most of EarthBound derives not from magic but from fear, greed, envy, and caprice: elements familiar by lived experience or association to every gamer who will play this game. Max Gorynski is a London-based analyst with a background in the digital humanities. He views the stories of video games through an interdisciplinary lens of philosophy, literary theory, and media theory. Learn more here. 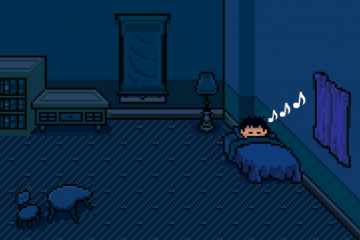 Despite being smaller than an MP3 file, EarthBound achieved more with its music than many symphonies manage.